Visiting Haverfordwest and looking to get a location to swim? Nice choice! Don't forget to tell us how did it go. 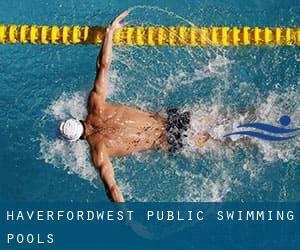 Introducing now Haverfordwest Public Swimming Pools swimming pool, a great swimming pool sent by a swimmer like you couple of days ago. Have you visit this pool? Do you work here? Please, make contact with us if you have information which you think is gonna be useful and recall from now on you may now promote every single pool just by sharing this page together with your close friends or adding comments in the Facebook boxes below. Come on and help this pool to be the very first in Haverfordwest! Among all the activities provided by the centre, if you are interested in swimming you will appreciate 25 meters, 4 lanes, Indoors. If you'll want to contact this Swimming Pool, email address and phone number are both number. Updated on 2019 On the grounds of Bush School , Pembroke , Wales , UNITED KINGDOM (Postal Code: SA71 4RJ). This sports centre offers 25 meters, 4 lanes, Indoors. Contact facts for this Pool which include phone number and email address are number. Updated on 2019 Marsh Road , Tenby , Wales , UNITED KINGDOM (Postal Code: SA70 8EJ). This sports centre offers 25 meters, 4 lanes, Indoors. Contact information for this Pool such as phone number and email address are number. Updated on 2019 Heol Dyfed , Fishguard , Wales , UNITED KINGDOM (Postal Code: SA65 9DT). Swimmers like you reported 25 meters, 4 lanes, Indoors. Phone number and email address are number for this Swimming Pool. Updated on 2019 Priory Road , Milford Haven , Wales , UNITED KINGDOM (Postal Code: SA73 2EE). This sports centre offers 25 meters x 8.5 meters, 4 lanes, 1 meters -2 meters depth, 1 meters -2 meters depth, Indoors. Contact information for this Pool for instance phone number and email address are number. Updated on 2019 Preseli School , A478 Road , Crymych , Wales , UNITED KINGDOM (Postal Code: SA41 3QH). This sports centre gives 25 meters, 0.9 meters - 1.9 meters depth, 0.9 meters - 1.9 meters depth, Indoors. Contact information for this Pool for instance phone number and email address are number. Updated on 2019 The Old School Grounds , Station Road , Narberth , Wales , UNITED KINGDOM (Postal Code: SA67 7DU). Among all of the activities offered by the centre, when you are enthusiastic about swimming you will get pleasure from 20 meters x 7 meters, 0.8 meters - 1.5 meters depth, 0.8 meters - 1.5 meters depth, Indoors. If you need to contact this Pool, e-mail address and phone number are both number.